Good morning! 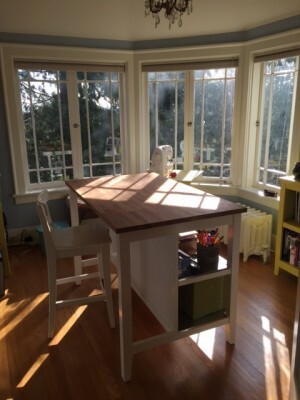 I am so excited this morning because I am writing this post from my newly reworked office! 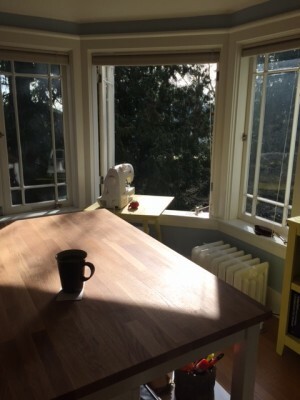 We have a lovely room in our house that is full of windows and gets amazing natural light. 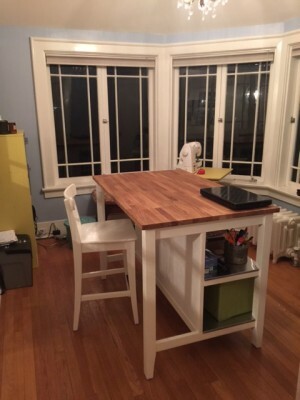 We were using it as an office but it was extremely drab and had turned into a dumping ground for all of the stuff in our house that we didn’t know what to do with. We had a very nice office desk in the corner but who wants to stare at a wall when there are huge windows to look out? Over the past few years, I have found myself getting more and more into arts & crafts, which means collecting materials that can pile up on you in a big mess of clutter. It’s part of the reason I was reluctant to take up sewing in the first place. Now I am not only sewing, but I am knitting, candle-making, embroidering, and even have a collection of glass bottles in case I want to paint or tint them on a whim! I decided to rework the office into a creative space. 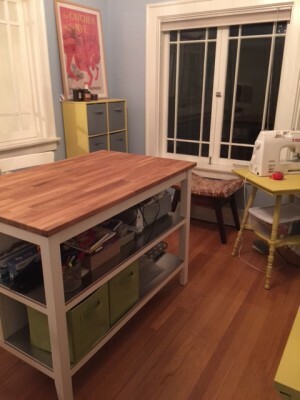 I planned on having Adam build me a craft/project table using two cubby style shelves. I convinced my mom to take a trip to Ikea with me and before we left, I consulted with Adam about my project table. I thought he could easily make me a table top and he just stared at me before saying, “will you please just buy something?” He is so handy and talented that I always think he can build me something. My famous line is “that wouldn’t be so hard, right?” Anyhow, he’s usually not too enthusiastic about my ideas. Luckily for both of us, Ikea had just what I was looking for- a kitchen island! 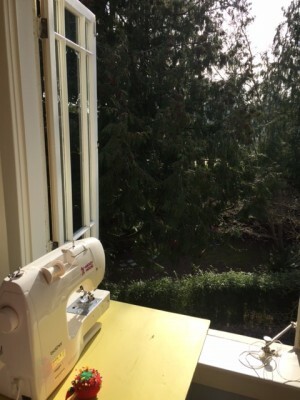 My mom and I saw it and knew immediately that it was the perfect size for the room, offered storage, and had a smooth top that will work great for laying out fabric, etc. The other furniture in the room was just espresso colored laminate bookshelves that came from Target. I thought about replacing them but then took on the task of painting them with Annie Sloan chalk paint. I had already painted a little table in English Yellow so decided to take the yellow further. Full disclosure- painting laminate furniture is pretty much terrible and I’m not sure it was worthwhile. However, it’s done now and I love the bright pops of yellow against the light blue walls. The room is like a bucket of sunshine. Of course I didn’t take any before photos but I will share my after photos. Had to include this morning’s photos with the beautiful sunlight pouring in through the windows. These windows all open up, which makes it feel like you’re outside. Unfortunately, that’s also a bit of a safety hazard with kids so I only open them when the kids aren’t home. I’m hopeful that this new room will keep me inspired to create fun things and maybe even a blog post or two!